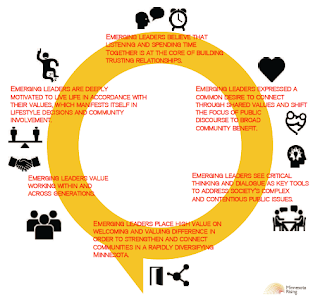 Theme 2 of 6: Emerging Leaders express a common desire to connect through shared values and shift the focus of public discourse to broad community benefit. The hope would be to elevate conversations past the yes/no binary to shared community concern. Participants named what some of these values could be, including integrity, empathy, intentionality, and respect across difference. Emerging leaders that participated in the second round of conversations expressed with a greater frequency than the first round of conversation participants that the time is now to become a generation that works for the benefit of all Minnesotans. One participant stated it in terms of geography, “With Minnesota that would be paying attention to what is going on in Greater Minnesota and making an effort to impact the lives of people who live there.” Another mentioned it in terms of racial and ethnic diversity, “We're better than the racial disparities in our state. They don't align with Minnesotan values. [I] hope people are getting to a point of not accepting them anymore. Let's get real about inequality and come up with solutions."